[2003-01-29] Frozen-Bubble elected "Best Free Game"
The Linux Game Tome organized the first ever elections to honor the Linux community's favorite games. 281 games and libraries were proposed, and 4417 votes occurred. Frozen-Bubble won the "Best Free Arcade Game", with 16% of the votes in this category, the two followers only obtaining 11%. But among the whole, Frozen even won the "Best Free Game" (any category)! Of course, voting has been tighter: FB gets 12% as well as the runner-up. Frozen-Bubble also won the "Best Sound/Music" category: as usual many congrats to Matthias for his talent recognized once again. In this vote, it's Dunkerque: FB obtains 19% of the votes while the second one only gets 12%. Let's note that in the "Best Graphics" category, FB comes 4th (with 11%) but the 3 first games are actually proprietary games ; therefore in this category it's a moral victory for Ayo - well deserved as well. 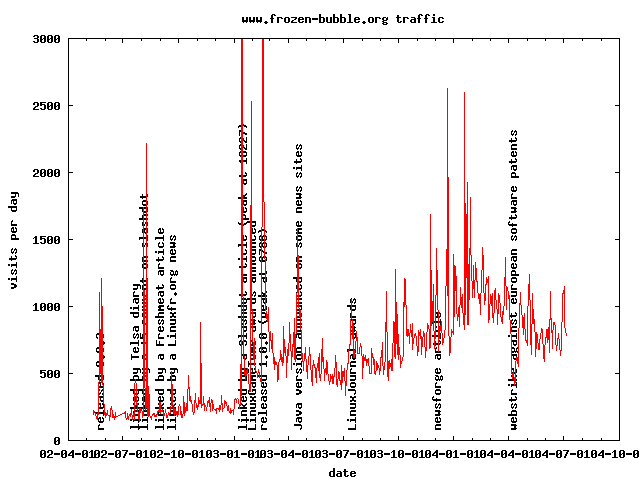 An article on the famous slashdot news site referred directly frozen-bubble.org! This resulted in an impressive peak of 16227 visits on 2003-01-15 - compare that with the traditional average of 250-300 visits a day, and you can feel the slashdot effect :). 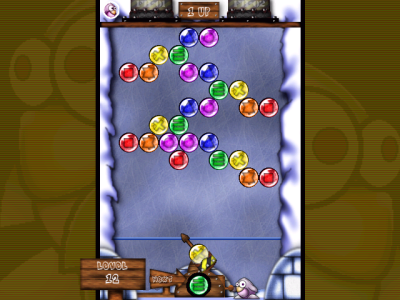 Daily news: a new version of Frozen-Bubble will be released soon (e.g. "weeks") adding a level editor contributed by Kim and David Joham - stay tuned! Alexandre Boeglin has managed to have Frozen Bubble working on the Yopi, a PDA running Linux! Impressive and fun :). You may get information about the Yopi on Linux Devices, and have a look at Alexandre's website to discover how does this work. Daily news: the site has reached more than 50,000 hits/visits (this counts only the hits on the first page) - there are around 250 hits per day, as you can see on the little graphics already linked in the top banner; still no 1.0 version of Frozen Bubble because still waiting for more levels.. and busy with other things (including another game project ;p). At last, the long-awaited new version of Frozen Bubble is out. This release brings mostly bug fixes, but also a couple of added features thanks to user suggestions and even some user contributions. Among others, it features the often-asked-for special bubbles for colourblind people (start frozen-bubble with the -cb option). But I'm still waiting for more levels to release 1.0.0! I'd really like to provide 100 levels for this release, so please contribute new levels! Please see the older news from "2002-02-20" down in these news. Some people requested that a Windows version be available. I already happen to not like Windows very much, but since I work for a free software company, I'm certainly not gonna spend some time porting the game to Windows. But... there is a solution for people who don't have Gnu/Linux, or who run a lousy Linux distro for which a binary package of Frozen-Bubble is not available! A special Demo Version, containing just a Linux kernel, basic libraries, XFree86 the graphical environment, Frozen-Bubble, and a bunch of glue based on the Mandrake installation program, is worth only 22 Mbytes of pure happiness :-). Available as a CDROM ISO image, or as a boot floppy bootstrapping the program from a Windows partition, please surf the Downloads section and grab your copy. I plan to release the stable 1.0 version of Frozen-Bubble sometimes in March or April, and I'd like to provide at least 100 different levels, so user contributions are very warmly welcomed! Please use a text editor on the file /usr/share/frozen-bubble/data/levels, and try to create new levels, you'll see that the file format is very straightforward: a "-" for a hole and a number for the colour number of the bubble (0: black; 1: white; 2: blue; 3: green; 4: yellow; 5: purple; 6: red; 7: orange). You may then send the levels you've added (not the whole "levels" file please) by email to newlevels at frozen-bubble dot org. We've had some great feedback after publishing 0.9.1; 9,000 hits in 48 hours so far on this website, thanks to many Linux news sites relaying the announce. There are now contributions of binary packages for Debian, Red Hat and a few other distributions, and it is time to publish the 0.9.2 version which fixes a few problems (see "changes" on the Download section). Today is the release of Frozen-Bubble 0.9.1. After a couple of months of development (see the making of section), we're now ready to publish an already pretty polished game, with all the features we wanted at the beginning: both 1p and 2p game, nice gfx, nice music. Enjoy!